This is one of my favorite photos. I titled it, ‘This is how it’s done!” I took it at a local bluegrass music festival I attended last year. Story is that in between performances, the musicians often gathered in small groups behind the outdoor stage to show off some “lick” they had, or to simply “jam” with anyone who wanted to participate. 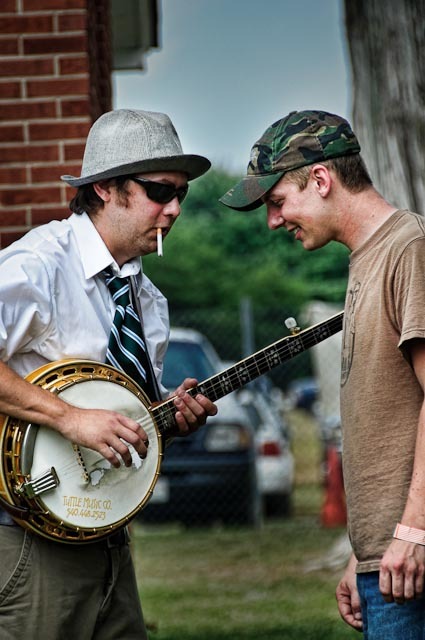 The guy on the left was a fantastic banjo player and I caught him showing one of the other performers some fine finger–work on his well–used banjo. I like the guys hat, sunglasses and cigarette hanging out of his mouth. When I look at it now I start to laugh, remembering the joking and chatter back and forth that went on. They were sure having a ball—obviously. D300, ISO 200, 170mm, f5.6, 1/640 sec. Developed in Lightroom 2.6 with slight Topaz Adjust alteration to give it more of a grungy look.